ew i would NOT eat this card. 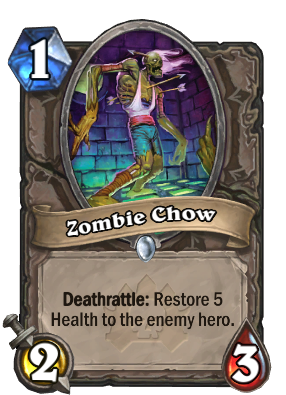 After so many expansions, our old friend zombie chow is still the best neutral 1 drop in the game. I never really liked this card that much, but that was because i liked to play face and do quick games instead of long drawn out ones. I miss you so much old friend. can i say i like golden animation? no, you are physically incapable of typing that sentence. Does this card work in a patron deck if you're facing a lot of aggro? I was getting really annoyed at the slower patron deck I had and teched these in and it seems to be helping me a lot. wait. why would you ever want to give your opponent +5hp? You want to play it early, and have your opponent kill it's minions into it. Think of it as a 1-2-3 with no effect if your opponent has full health. The card image here on hearthpwn is slightly too small compared to the standard size used by most other cards. Love this card! It's so good against all of the aggro cancer decks out there.